Shelley is off on a new adventure! This is a story, not a blog. Because, I can tell a story, but I don’t know squat about blogs. For the past two and a half years, my husband (Robert), dog (Keesha), and I have been rootless. 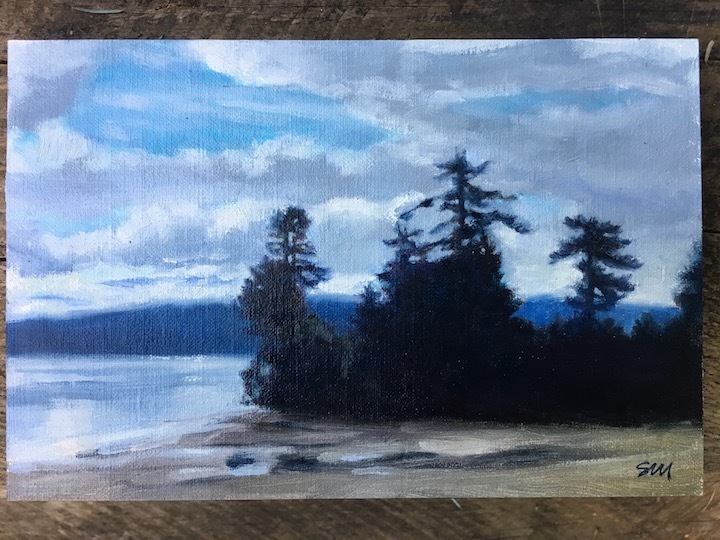 We’ve lived in a very tiny trailer over the spring/summer/fall months, while traveling through some of the most beautiful countryside in the US and Canada, so that I could paint the landscape. We’ve logged over 20,000 miles, weaving back and forth along the border: from Idaho to Oregon, Washington, Vancouver Island; down to Colorado, back up through Nebraska and the Dakotas to Minnesota, into Ontario and a bit of Lake Superior’s northern shore; then back west to Montana…that was just the first summer. Last summer, we again went north- into Canada from Montana, across the Canadian Rockies, through Alberta, Saskatchewan, Manitoba, and Ontario. This time, we made it all the way around Lake Superior. Neither Robert nor I had ever actually traveled in an RV before. We’d done tent camping, sure, when our boys were younger, but we had absolutely no experience with towing, maintaining, or living in a trailer the size of a walk-in closet-which sounds pretty crazy now! We camped in Provincial, National, State, and County Parks, as well as commercial RV campgrounds. We’ve learned a lot in these peripatetic months. I’m going to write a story of our travels–things we saw, places we visited, paintings I made–along with tips about oil painting, random thoughts about life and art, and things I discovered about living, and painting, in a very small space. I’d be delighted if you came along with me!